The Compact Wireless Presenter is the ultimate all-in-one wireless presentation device providing total control over your PowerPoint presentations. Start, manage and end your presentation from distances of up to 32 meters (100 ft) and use the built-in laser pointer to highlight your presentations. 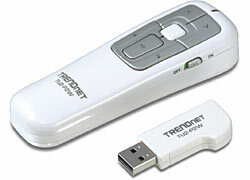 Travel light with less to lose, by storing the wireless USB adapter within the presenter itself. Simply slide out the USB adapter, plug into your computer and run your presentation. Wirelessly start the presentation, manage slide progression forward and backward, dim the screen and jump to another work window. Simply Plug and Play this versatile device with no additional software required.